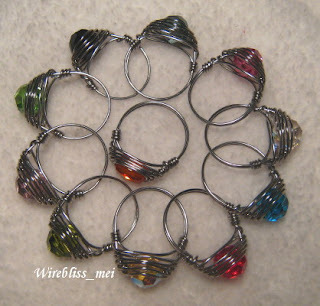 Here is a collection (11 in all) of colorful herringbone weaved swarovski crystal rings. Wear them to suit your mood. Blue- when you are feeling blue, green when you are full of envy, pink - romantic?, red - angry? Oh..whatever! I am back to herringbone weave craze again. Well actually i sold one the other day and someone asked me to make another one. So, while i am at it, I decided to do more of them, one each for the different colors. Really enjoyed myself making them this afternoon. 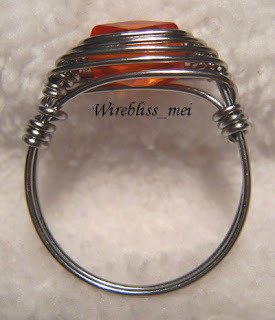 Except for the orange faceted stone, they are all 8mm swarovski crystal. 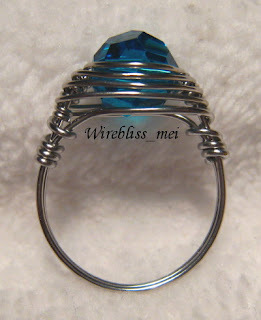 I used 24g wire for the herringbone weave and 22g for the ring. 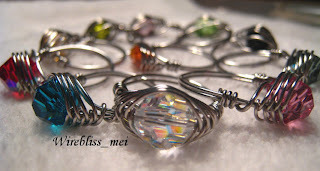 Ring size ranges from 12 to 13. 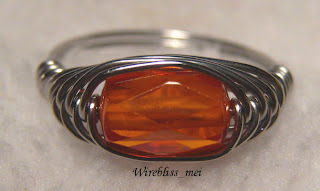 Love the orange color one so I am keeping that one for myself. The rest, well if there are buyers, i am willing to part with them. They are all priced at $10.00.